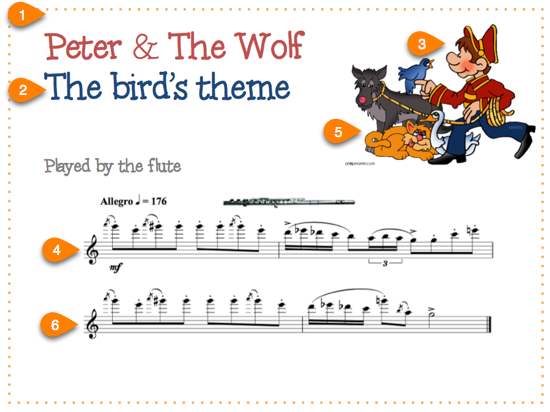 There are lots and lots of ready-made music education worksheets, Powerpoint files and interactive whiteboard resources available for purchase or free download if you look hard enough online. But what about those times when you want to create something from scratch yourself? Maybe you can’t find an existing file that meets your needs. Or perhaps you did find one, but it’s too advanced for your music class, it’s hard to read, or you simply you don’t like the way it looks. 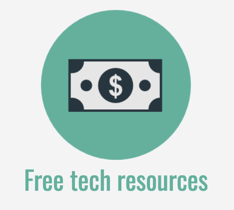 It’s easy to make your own digital music resources once you’ve learnt a few simple tricks. In my interactive whiteboard courses I teach 5 must-know techniques and if you learn these 5 techniques you can create your own resources like a professional! The examples shared below and the techniques used to create them work on all these options. One of the great things is that the instructions are quite similar across all of those software programs, so once you know the techniques in one, you will probably be able to find your way in another without too much pain! Here are my top 5 basic techniques for creating resources. Once you have learnt these techniques, you can make a wide variety of worksheets, presentation files and interactive displays that you can show on the data projector in your classroom. 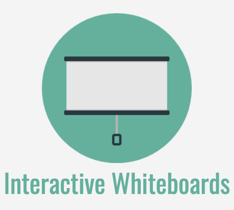 All types of interactive whiteboard (IWB) software, Powerpoint and Keynote work in similar ways. They all start with a blank slide to which you add a variety of elements: text, shapes, lines, images and so on. The terminology and menus in each are also similar. The instructions that follow are general in nature so that they can be applied to whichever software program you are using. Having said that, I have listed specifics for a few programs. If you’re using different software and can’t work out how to do something, please consult The Oracle (Google), your software Help menu or an expert friend for more information. 1. Click on the Text Box button or the button with a capital A. You may also be able to go to the Insert menu and choose Text Box from there. 3. Once the shape is on the page you’ll probably need to make a few adjustments: resize the shape if necessary by dragging a corner (ninja tip: hold down the Shift key while you drag to maintain the aspect ratio of the shape). 4. Most shapes will be “filled in” (solid). If you would prefer just an outline, select the shape, find the Fill setting and change it to “No Fill”. You can usually find this setting in places like the Formatting Palette (Powerpoint), the Inspector (Keynote) or in the object Properties menu (Notebook). You can also adjust the colour of the circle and the line thickness. 1. Go to the Insert menu and select Image (or “Picture” or “Media”), and locate the image on your computer. Click OK/Insert. You can link text or an image on your slide to a webpage or Youtube video so you don’t need to remember the link or find it amongst your bookmarks. It’s REALLY easy to do and can make life so much easier when you’re in front of a class and you need a link quickly! 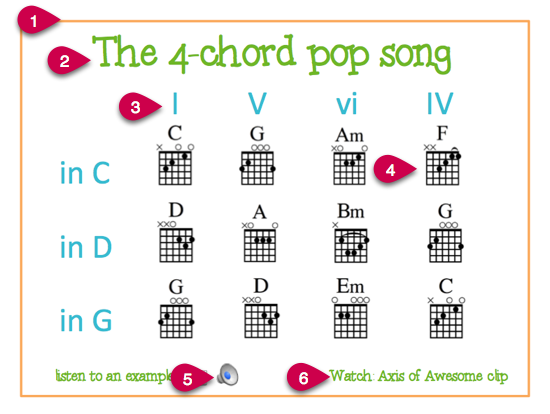 As a music teacher, you often need to play a musical example, exercise song or backing track. 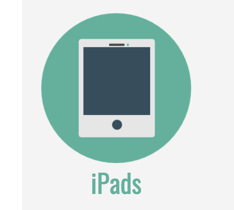 By embedding an audio file into your presentation software you always have it on hand and don’t need to search through your iTunes library or CD collection while your class waits. In Powerpoint and Keynote, you can embed an audio file (or multiple audio files) on the slide. When you are in presentation mode (i.e. when you are “playing” your presentation) the audio file will begin to play when you click your mouse. 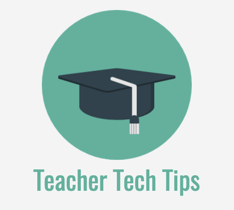 Interactive whiteboard software is a bit more flexible: you can attach the audio file to a specific text object or image on the slide and when you or a student taps the object with your finger, the audio will start to play. This allows you to have complete control over which audio files play at which time. 1. 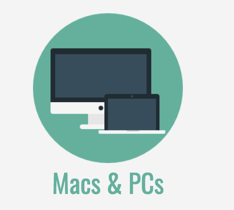 Go to the Insert menu and look for insert “sound”, “audio”, “music” or “media” (Powerpoint is Insert > Movies and Sound or Sound and Music, Notebook is Insert > Sound and Keynote is Insert > Choose). 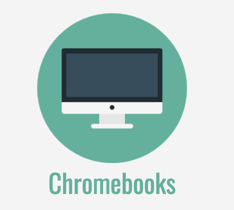 You can also look for a Media, Sound, or Audio button on the toolbar. The audio file will now be embedded on to the slide and will play when you’re in presentation mode. If you’re using Powerpoint or Keynote, don’t worry too much if you can see an audio icon on the slide. That won’t show once you’re in presentation mode. 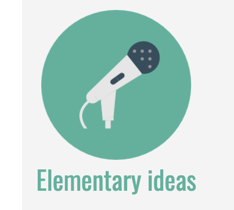 Let’s look at a few examples and run through the steps to create them. 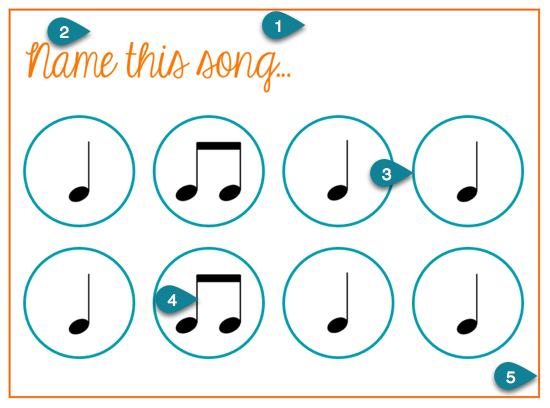 Below is a common type of exercise – a rhythm contained within beat circles that you would like students to identify. 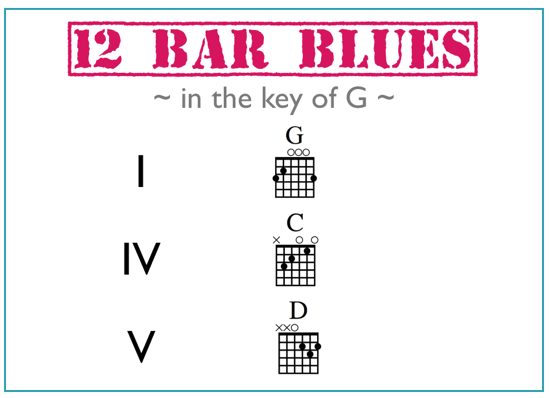 Bonus: free downloadable collection of guitar chord diagrams available here. 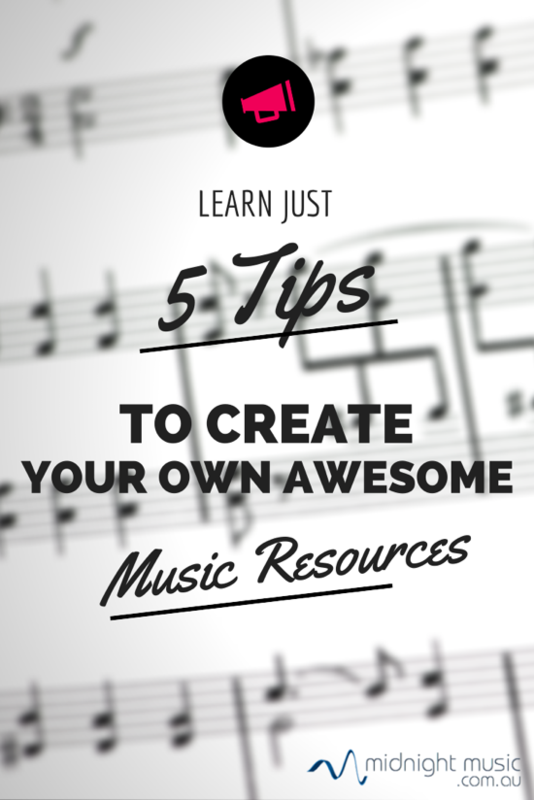 If you’d like to know more about creating your own music resources just like these ones, I’d love to help you out in the Midnight Music Community. 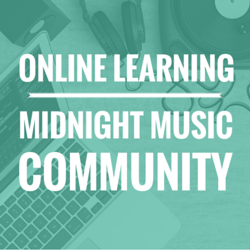 Join me and the other music teacher members for access to online courses (12 in total! 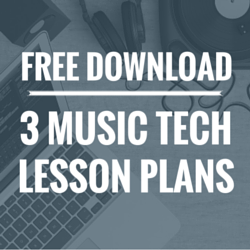 ), regular new training sessions, and help with your music tech questions. Hi I love your tips and tutorials – just wondering where you get the fonts for the lettering you use? You mean the fonts in the title image? I use a free graphic design tool called Canva to create those and the fonts are included there. Try it out – it’s fanatastic! Hi Katie, do you know how to save Powerpoint files that you have put Video into to be able to view on a device other than the one you made it on? I’m not sure whether I am using the proper format video files. 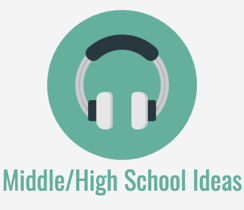 I make Powerpoints for Music History with song clips in them but this would make reliefs and distributing for students who are absent, or merely flipped classroom ideas so much easier if I could get this to work. They are probably there but I can’t see them. If they haven’t been created yet would you be able to? I would happily give a donation for your time. Hi Liz! 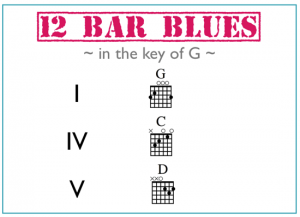 I know you found the Notation Library images already from the comment you left on that post, but I just thought I’d answer this here. Some of the things in your list are already in the library. You might need to poke through some of the sub-folders to find them (eg. dotted quaver and semiquaver are in the Notes folder). The others are not there but I will be updating the library soon and will add your requests to my list of things to create.